Air Canada limped into its 75th year of business after posting two consecutive years of losses and now finds itself in a public relations fiasco as wildcat strikes by employees recently disrupted operations and the sudden closure of its primary maintenance provider Aveos has put the carrier on the defensive as it attempts to deflect criticism for 2600 employees suddenly losing their jobs. Those snafus, followed a higher number of pilots calling in sick as the Canadian Government stepped in to prevent both pilots and mechanics from striking as negotiations to reach agreements to replace concessionary contracts forged in 2009 hit impasses. It looks as if Air Canada and its management team headed by CEO Calin Rovinescu face major obstacles in their goal of concluding labour contracts that he concludes are “essential to create a climate of stability”. At the same time, competitive pressure on Air Canada from its main rival WestJet is unrelenting as the carrier continues to bolster its presence in Air Canada’s lucrative business markets in the eastern part of the country. The airline is also seeing increased pressure on its transborder markets from both WestJet and by fellow Star Alliance member US Airways' attacks Air Canada on its main markets from Washington National Airport. Air Canada finds itself facing some sort of obstacle in nearly every aspect of its operations, even in its regional business, as it works to negotiate lower rates paid to its main partner Jazz. Next year it likely face a new level of competition from WestJet as its seeks to launch a new regional subsidiary in 2013. Recent actions by pilots and ground workers that disrupted flights and left customers pondering the accountability of Air Canada’s brand are the culmination of what the carrier has described publicly on numerous occasions as protracted and difficult labour negotiations. Air Canada allowed a three-day strike to ensue in 2011 by its call centre and customer service staff to highlight the importance of pension reform going forward. Pensions have been the major sticking point in negotiations as Air Canada seeks relief from its defined pension benefit plan. The carrier’s flight attendants rejected two tentative agreements before ratifying a deal in late 2011. Canada’s Government also stepped in to head off a strike by the airline’s 6800 unionised flight attendants. 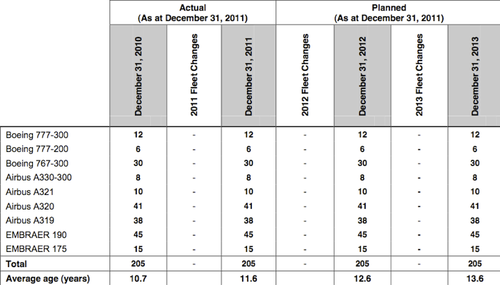 As of 01-Jan-2011, the aggregate deficit in Air Canada’s domestic pension plans was CAD2.2 billion. Valuation for 01-Jan-2012 will not be completed until mid-year. During 2009 when Air Canada secured concessionary contractions from its unionised labour groups to stave off a formal restructuring, the carrier also won relief from the Canadian Government and unions to freeze pension payments for 21 months and then cap contributions from 2011 through 2013. The carrier’s total contribution in 2011 was CAD385 million, and is expected to rise to CAD426 million this year and grow to CAD476 million in 2013. The carrier has ratified agreements with all of its unions except for its two largest groups, its 3000 pilots and the 8600 mechanics, baggage handlers and cargo agents represented by the IAMAW. Those new deals include relief from Air Canada’s pension solvency deficit and an ability to create a new hybrid scheme for new hires split between a defined pension and defined benefit plan. Changes to the pension plans are subject to regulatory approval. Chances of Air Canada reaching deals with pilots and IAMAW in the short term look dim as both those work groups are seething at airline management and the Federal Government, which passed legislation to prohibit strikes by those work groups, pending arbitration. Now the Air Canada Pilots Association is suing the Government, arguing the intervention and the passage of the Protecting Air Service Act designed to block work stoppages violates Canadian labour law. The union representing mechanics has indicated it is evaluating filing litigation to challenge the Government’s actions. Pilots a year ago rejected a tentative deal that would have allowed for the creation of a new low-cost subsidiary, and now Air Canada has reportedly looked to launch the airline offshore. Mr Rovinescu maintains that setting up a long-haul low-cost subsidiary is an essential part of the airline's future. Labour ire reached a zenith late last week when Air Canada ground workers staged a spontaneous strike that forced the cancellation of roughly 80 flights. The lost revenue and bruised customer sentiment is occurring as carriers brace for rapidly rising fuel costs that could potentially weaken demand. As the unrest persists, Air Canada’s damaged image can only compound the potential softness in demand triggered by rising oil prices. Former Air Canada subsidiary Aveos closed its doors as the airline explained roughly a month ago that a projected 10%-14% increase in maintenance costs this year would largely be front loaded during the first quarter. The company’s maintenance expense in 2011 was CAD681 million, a 27% rise over the year prior. Aveos claimed it had lost CAD16 million during the first two months of this year as Air Canada reduced, deferred and cancelled maintenance work. Bankruptcy court documents show Aveos lost CAD49 million during the fourth quarter of 2011 and that, based on its Jan-2012 financials, its liabilities exceeded the book value of its assets by CAD219.8 million. Aveos claims Air Canada during the last few months has ordered a halt of all maintenance of aircraft, engines, and parts even though some of the work was scheduled more than a year ago. The maintenance company also argues that even though it is the exclusive provider for both heavy airframe and engine maintenance for Air Canada, the carrier has solicited bids from competitors, and is actively seeking bids for heavy maintenance work from other service providers. During a recent earnings call, Air Canada management stated its airframe contract with Aveos was up for renewal in 2013, and explained there may be opportunities to improve costs at that time. Air Canada is facing a steady climb in the age of its fleet, and by 2013 the average age will reach 13.6 years, which means the number of intensive heavy aircraft checks will rise. Aveos balked at Air Canada’s offer of CAD15 million in DIP financing, describing the terms imposed by the carrier as onerous and uneconomic, and it was not prepared to agree to the elements contained in Air Canada’s offer. Aveos argued the financing would be unnecessary if “Air Canada paid Aveos what it owes”. Air Canada rebuffed Aveos’ claims, stating in 2011 the maintenance company performed 91% of its airframe checks and 93% of its engine maintenance, and work was only performed by third parties when Aveos was unable to perform the maintenance, which was in compliance with its agreement with Aveos and relevant labour agreements. Air Canada states it paid Aveos CAD9 million on 15-Mar-2012 that included invoices in dispute. Air Canada was listed as Aveos’ top creditor in court filings, which did not specify the amount owed to the carrier. But Air Canada in outlining all the financial support it has given to Aveos since the maintenance provider undertook an out-of-court restructuring in 2010 said Aveos owes the carrier in excess of CAD35 million. Air Canada’s CAD249 million net loss in 2011 stands in stark contrast to the CAD148 million profit recorded by rival WestJet. While Air Canada has posted losses during the previous two years its legacy counterparts in the US have rebounded from the recession and with the exception of American Airlines, posted profits in 2011 as fuel costs in some cases surpassed 2008 levels. Even as Air Canada had CAD2.1 billion in cash at the end of 2011 and paid down nearly CAD300 million in debt, its stock price during the last six months has fallen 36.2%, according to CAPA data. Management believes Air Canada’s weaker performance relative to its peers is directly attributable to the carrier’s challenging labour situation and the risks associated as being one of the few remaining carriers remaining with a defined pension scheme. But as Air Canada has to increasingly place its focus inward, its rivals are stepping up competitive pressure, particularly WestJet, as the carrier has added frequencies in the heavy business traffic markets of Toronto-Montreal, Toronto-Ottawa during the last year. WestJet’s total 2011 CAD3.1 billion revenue were 14.8% higher than the CAD2.7 billion recorded by Air Canada, which was more exposed to Europe’s weakening economy and the fallout from weakened demand in Japan after the earthquake and tsunami that struck the country in March of last year. But Air Canada’s split in revenues generated from domestic and international is fairly close, with domestic revenues representing roughly 39% of its total revenues an international markets accounting for 41%. WestJet is also strengthening its transborder position through new flights from Toronto to New York LaGuardia with the debut of eight new daily flights in June. Its new LaGuardia service will connect with new flights being introduced by new codeshare partner Delta Air Lines at its newly minted LaGuardia hub. The tie-up between WestJet and Delta will also allow WestJet to collect passengers from LaGuardia to flow through Toronto to its Canadian network, further enhancing its revenue generation. Air Canada has estimated that the number of passengers connecting through Toronto Pearson International Airport has increased by 110% since 2009, and inevitably WestJet will benefit from some of that connectivity from its new service to New York. WestJet is the second largest carrier at Pearson in terms of weekly seats offered from Pearson, and the airport is the carrier’s second largest served behind its Calgary base. Air Canada is also facing new competition in three markets from Washington National Airport where it currently holds a monopoly – Ottawa, Toronto and Montreal. Fellow Star Alliance member US Airways launched flights to Ottawa on 25-May and plans to introduce flights to Toronto and Montreal in July. From the beginning of May through September, US Airways will offer 65% of the roughly 2106 weekly seats offered from National to Ottawa while Air Canada’s share is about 35%. The Star partners do not codeshare, so both carriers will continue operating in all the markets from National to Canada. US Airways is the largest carrier at National, so the new flights to Canada will likely appeal to its broad passenger base that includes heavy corporate traffic between the US capital and Canada’s major business centres. As if that were not enough, Air Canada and its former subsidiary and now regional partner, Jazz, are also awaiting the decision of an arbitrator over a dispute in a benchmarking exercise to determine the mark-up rate Jazz parent Chorus Aviation charges for its controllable costs as part of the capacity purchase agreement between the two carriers. Benchmarking exercises were scheduled for 2009 and 2012 that compared the controllable costs incurred by Jazz with comparable regional operators. But the 2009 benchmarking was never completed and the two carriers agreed to binding arbitration. Air Canada believes a different method should be used in the benchmarking exercise, and concludes the mark-up on controllable costs should fall from 12.50% to 9.54%, which could result in Chorus being required to pay its major partner CAD26 million. Despite heavy handed protectionism too, Air Canada remains at risk, as the labour confrontation continues. This is a complex equation, but there may be limits to how far the government will go to maintain international policies that show few obvious signs of national benefits. In a speech in Canada earlier this month, IATA CEO and director general Tony Tyler compared Canada with Australia, which has a much more open philosophy. He noted that, in "Australia, a country that ... closely resembles Canada in terms of geography, demographics, resources and other vital statistics...aviation directly contributes 2.2% of GDP for Canada, and 2.6% for Australia. If we include catalytic benefits through tourism, GDP contribution rises to 2.8% for Canada - but to 6.1% for Australia. 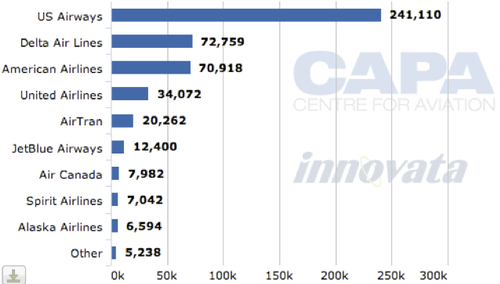 "Furthermore, although Canada has a population that is approximately 50% larger than Australia and a landmass that is 20% greater, Australia has more air travel: 78 million passengers travel to, from and within Australia, compared to 71 million for Canada. 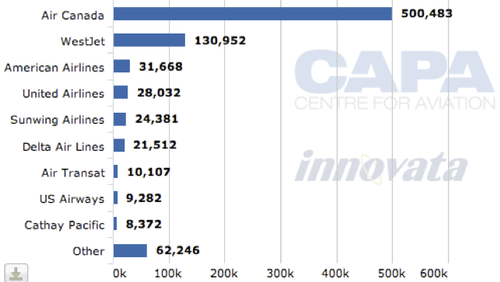 Australia’s airlines carried 58 million passengers, compared to 52 million for airlines based in Canada." The cost of this protection is self-evident. But the government's confusion becomes even more obvious. As Mr Tyler continued, "There is one statistic, however, where Canada wins hands down over Australia: aviation’s contribution to taxes. It is about 19% higher in Canada, excluding the impact of domestic taxes on fuel. Were we to include fuel, the discrepancy would be even greater, since Canadian fuel taxes are about double the amount for Australia." For the moment Air Canada's milestone anniversary year sees it mired in chaos that could jeopardise a brand the carrier has spent the last 75 years to preserve. As many US carriers were able to emerge from what their management teams deem as the “lost decade” on a path to stability, Air Canada management stresses the carrier is still in the midst of a transformation plan. As things stand, the prospects of another 75 years do not look good.